^ Lodish, H.; Berk, A.; Zipursky, S.L. Molecular Cell Biology: Section 21.4Neurotransmitters, Synapses, and Impulse Transmission 4th. New York: W. H. Freeman. 2000. ^ Cherry, Kendra. 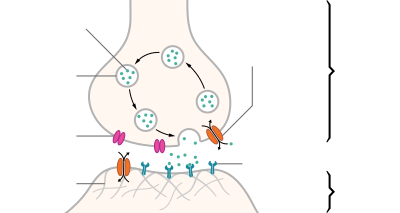 What is a Neurotransmitter?. [6 October 2014]. ^ Lauder, RM; Morris, HG; Nieduszynski, IA; Huckerby, TN. P51. Isolation and extractability of fibromodulin. Bone. 1994-01, 15 (1): 128–129. ISSN 8756-3282. doi:10.1016/8756-3282(94)90974-1. ^ Luo, Minmin, Ren, Jing. Neurons Corelease Glutamate and Acetylcholine and Activate Postsynaptic Neurons via Distinct Transmission Modes. Neuron. 2010-12, 69 (3): 445–452. ISSN 8756-3282. doi:10.1016/j.neuron.2010.12.038.